Back when we had four kids living at home, date nights only happened about twice a year and they always involved an overnight at a local inn and dinner at a nice restaurant. Very nice. Now that we're down to two kids who are both teenagers, opportunities for date nights pop up much more often. Even better. These days my job allows us to eat out twice a month, so it's much more fun to cook at home for our date nights. For our unexpected date night last week, we began with scallops sautéed in butter, served with a sweet pea puree. 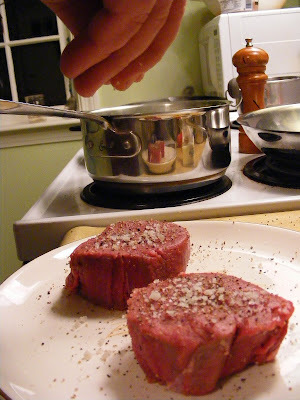 Then it was on to steak au poivre. 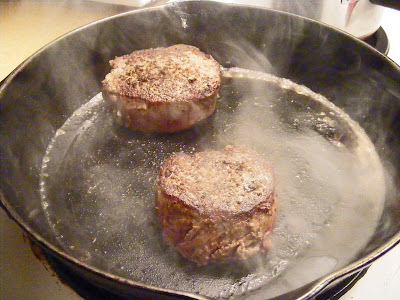 The Kitchen Genius seasoned two small filets with sea salt and fresh ground cracked pepper. He then seared them in a cast iron skillet and then put it in the oven to finish them off. 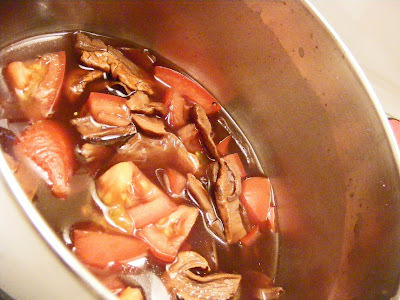 In the meantime, he simmered dried porcini mushrooms, a chopped tomato, some red wine and other secret ingredients for a sauce to go along with the steak. My job was to be the prep cook for his creations, but the side dish was all mine. 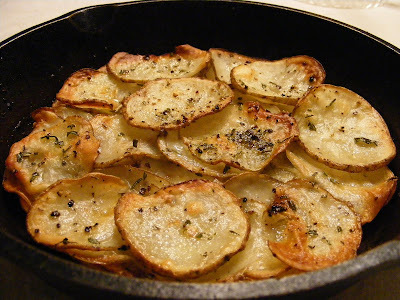 I sliced two large potatoes very thin and layered them in another cast iron skillet, brushing melted butter on each layer, and seasoning them with chopped fresh rosemary, salt and pepper. Instead of making a big salad like I usually do, I hollowed out a tomato and filled it with some baby greens tossed with balsamic vinaigrette. I want a date night!! (we have them often tho, with no one left at home) but not with your menu!! Looks great. Can I come to your house for date night? Oh wow - I will DEFINITELY gategrash your next date night! What a perfect meal. I love cooking with Paul; it's such a nice part of our married life. Date night??? What's date night?? where do you live again? i know i'm only 20 mins away. I do not doubt that the dinner was great! The hollowed-out tomato stuffed with baby greens is brilliant. I'm telling you now that I'm borrowing this idea . . . ! I'm going to steal your recipes for my date night tonight ;) thanks for posting! Where was I on this date night? Who's been cooking in my kitchen? JK, love you! This looks like a great meal for date night! 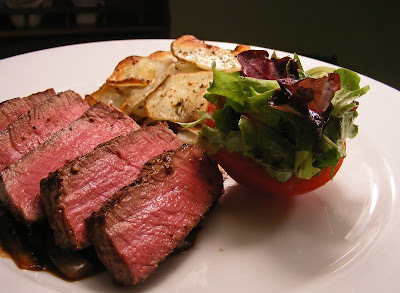 The steak is done perfectly for me and I love the little salad! This looks like a magnificent dinner! Everything sounds fabulous and luxurious, especially the porcini wine steak sauce. wow - date nite is great at your place - looks excellent. What. A. Meal! My husband would think he had died and gone to heaven with this one. So fantastic! An amazing meal! those steaks look so perfect! Date nights at home are the best for sure! What a dinner, I love date night! 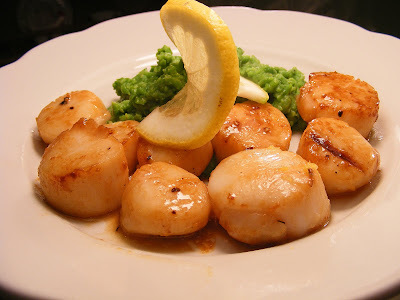 Every time I make scallops (which I adore) they taste terrible. Yes - I know you're going to say I overcook them :) But that isn't what's happening. Can you tell me the kind of scallop you used? And exactly how long you sauteed them in butter please? 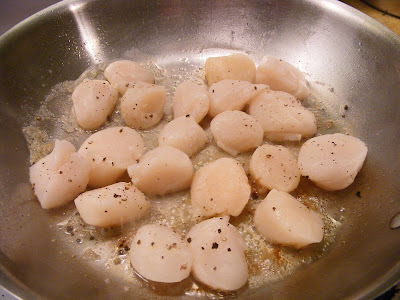 And anything else about cooking scallops in the frying pan? Or oven? Thanks!